We’ve cracked the nut for Story Circles and universities with one simple realization: it needs to be EMBEDDED within an existing course. DEVELOPING AND SPREADING. Government agencies have been the major site of Story Circles so far, but now it’s ready for universities. 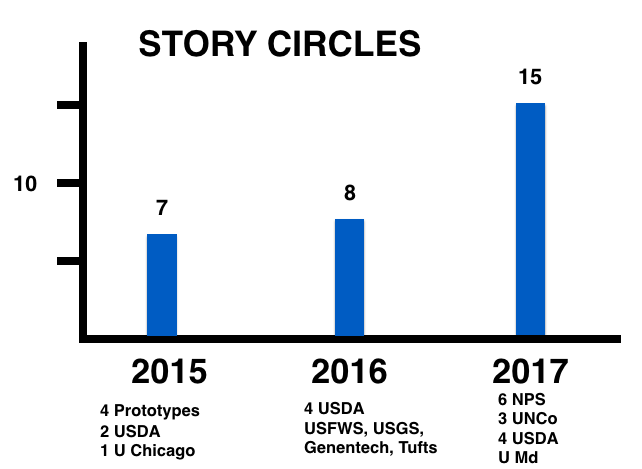 While the good folks at USDA are running their eleventh Story Circle and in two weeks we’ll be presenting their sixth Demo Day, it’s been a challenge to figure out how to make the training work at universities. The problem is schedules. Government agencies have everyone at the same work environment day after day, making it relatively easy to schedule the 10 one hour sessions. But universities have student schedules all over the map. As a result, the set of Demo Days we ran last fall at three universities produced no Story Circles. Solution: Embed the training into an existing course. That’s what will happen this fall at University of Northern Colorado. They have a weekly two hour graduate student training course. For ten weeks, Story Circles will take up one of the two hours each week. Very simple. There are three inviolable rules for Story Circles: 1) You may never stop the hour-long cueing video during a session, 2) You must stop mid-sentence when the cue goes off, and 3) You must always have all 5 members of the circle for a session. It’s been that last one that’s been the challenge. This will fix things for universities.